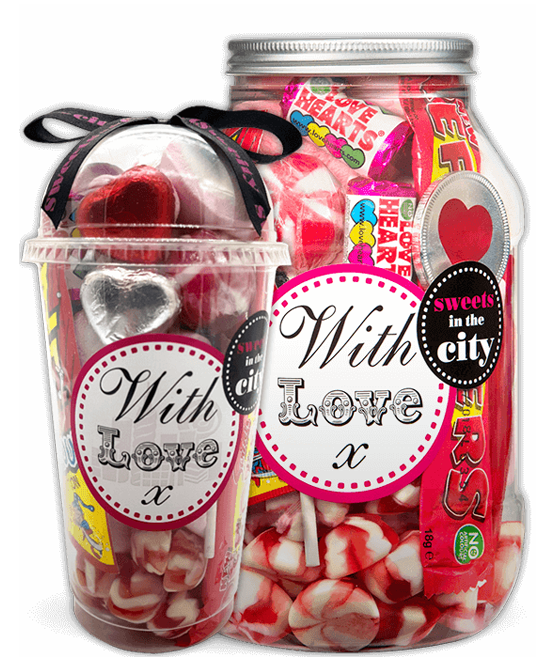 Send sweets with love, and do it in style! 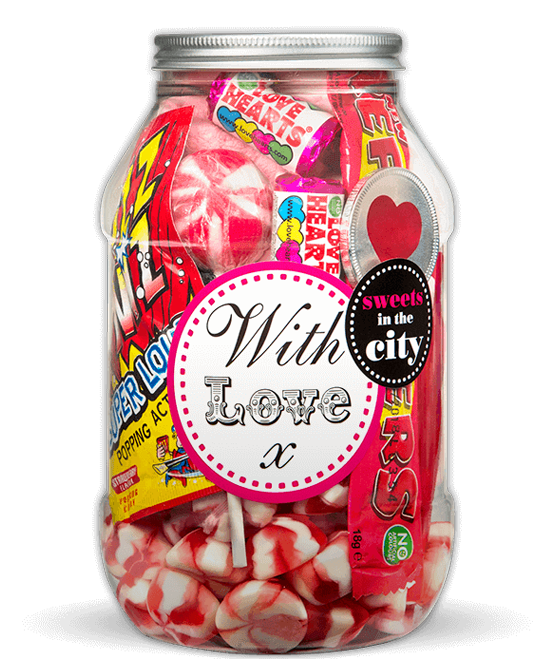 Celebrate your sweet romance with this mouth-watering jar of love sweets. These hand-packaged sweets are a wonderful way to send your love without the traditional flowers and chocolates - you can even customise the label with a heartfelt message for your partner! These love sweets really are perfect for your sweet romance. In the mood for more sweet romance? 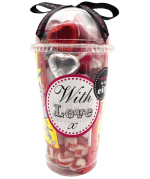 Check out our other romantic love sweets! Product 1: Sugar; Glucose Syrup; Corn Starch; WHEAT Flour; Stabilizers: Glycerol, Sorbitol; Dextrose; Acids: Citric Acid, Lactic Acid, Malic Acid, Fumaric Acid; Modified Potato Starch: E1404; Gelatine; Emulsifier: E471; Flavourings; Colour: E120; Acidity Regulator: Sodium Citrate; Vegetable Oil: Coconut; Glazing Agent: Beeswax. Product 2: Glucose Syrup; Sugar; Beef and Pork Gelatine; Corn Starch; Gelling Agent: Pectins; Flavourings; Fruit and Vegetable Concentrates: Radish, Tomato, Apple, Pumpkin, Carrot, Blackcurrant; Coconut and Palm Kernel Oil; Glazing Agents: Beeswax, Carnauba Wax; Colours: E120, E171. Product 3: Sugar; Glucose Syrup; Acidity Regulators: Citric Acid, Malic Acid; Flavouring; Colours: E120. May also contain: MILK, NUTS, SOYA and cereals containing GLUTEN. Product 4: Milk Chocolate (55%): Sugar, Whole MILK Powder, Cocoa Mass, Cocoa Butter, Whey Powder (MILK) , Emulsifier: SOYA Lecithin; Natural Vanilla Flavour. Caramel Creme Filling (45%): Sugar, Vegetable Oils and Fats (Palm), Skimmed Cocoa Powder, Whey Powder (MILK) , Emulsifier: SOYA Lecithin; Vanillin, Flavours. Milk Chocolate contains cocoa solids 28% minimum, milk solids 16% minimum. May also contain NUTS and cereals containing GLUTEN. 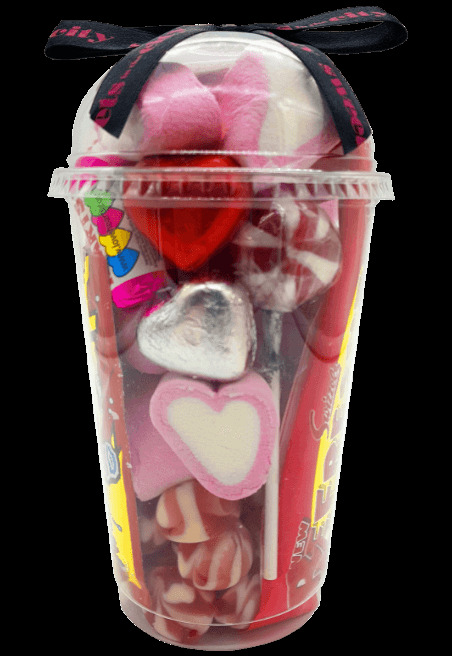 Product 5: Glucose-Fructose Syrup; Sugar; Water; Gelatine; Anti-Caking Agent: Maize Starch; Flavouring; Colours: E100, E120, E131. 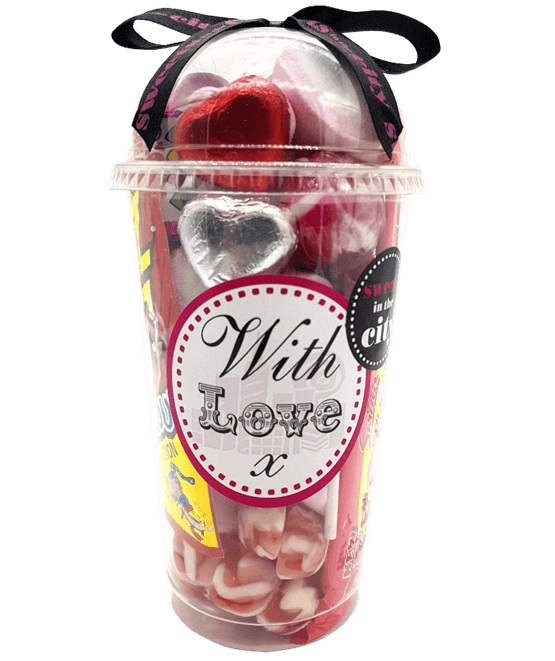 Ingredients on wrapper: Refreshers Bar, Fizz Wiz and Love Hearts. For allergy advice including cereals containing GLUTEN, see ingredients in bold. Contains MILK, SOYA, NUTS, GLUTEN and WHEAT.